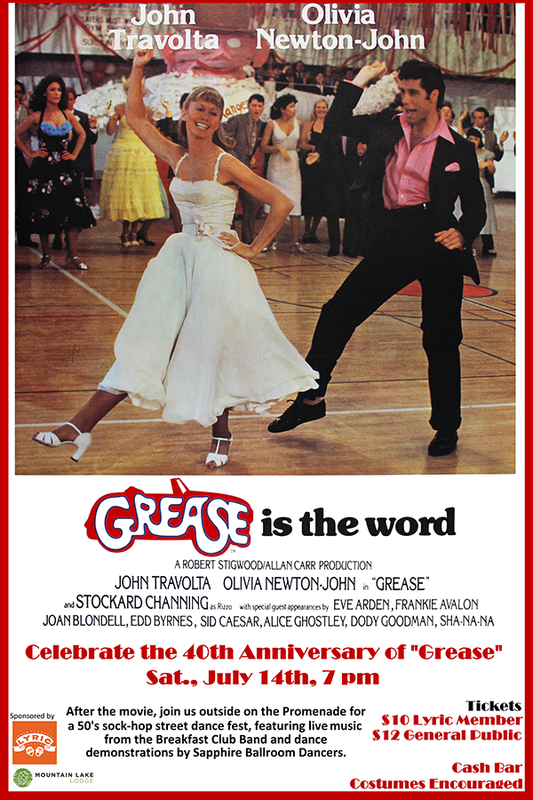 Lyric Theatre and Mountain Lake Lodge present Dancing in the Streets celebrating the 40th Anniversary of Grease on Saturday, July 14, 2018. Dancing in the Streets begins with a showing of the classic film "Grease". After the movie, head outside on the College Avenue Promenade for a 50s sock-hop street dance fest featuring live music from the Breakfast Club Band and dance demonstrations from Sapphire Ballroom Dancers. "Grease" is a musical about teens in love in the 50's! It's California 1959 and greaser Danny Zuko and Australian Sandy Olsson are in love. They spend time at the beach, and when they go back to school, what neither of them knows is that they both now attend Rydell High. Danny's the leader of the T-Birds, a group of black leather jacket-wearing greasers while Sandy hangs with the Pink Ladies, a group of pink-wearing girls led by Rizzo. When they clash at Rydell's first pep rally, Danny isn't the same Danny from the beach. They try to be like each other so they can be together. The film is rated PG-13 and stars John Travolta and Olivia Newton-John. For more information, visit: http://www.imdb.com/title/tt0077631. The cost is $12.00 for the general public and includes the film and post-movie party. To purchase tickets to the event, visit: https://public.ticketbiscuit.com/Lyric/Ticketing/339876. 50s era "Grease" costumes are encouraged. A cash bar will be available. In addition to the event, Mountain Lake Lodge is offering a special weekend package. For more information, visit: http://www.mtnlakelodge.com/blog/special-events/dancing-in-the-streets---grease--july-14-2018.aspx. To view the event flyer, visit: https://i.imgur.com/pd8wxiN.png. For more information about the event, visit: https://www.facebook.com/events/197529501060719 or http://www.thelyric.com/event/grease-40th-anniversary-screening/.